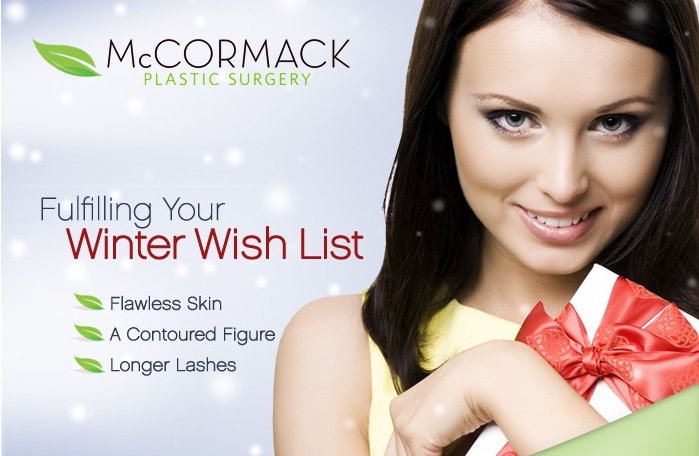 McCormack Plastic Surgery wants to fulfill your winter wish list and we’re offering huge pre-holiday specials on a variety of in-office treatments and products! From now through the end of the year, take advantage of special package deals on Latisse™ eyelash enhancer, Total FX Laser Skin Resurfacing, Juvederm™, BOTOX™, Sculptra™, CoolSculpting by ZELTIQ™, Laser Hair Removal, IPL Treatments and medispa facial gift certificates. Here’s to looking and feeling our best in the New Year!